According to reports Dawuroo.com is picking up, the manageress of ace highlife musician Kwabena Kwabena, the beautiful ‘Good Morning Ghana” hostess on Metro TV Frema Ashkar is set to marry another man this January 2018. Frema Ashkar is divorced with two children. After her divorce, she kept her ex-husband’s surname “Ashkar” but Dawuroo.com gathers that is about to change. 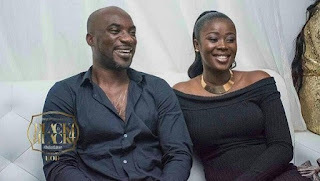 Frema Ashkar as the manager of Kwabena Kwabena was allegedly at the center of the artist’s marriage troubles and subsequent divorce to his ex-wife Abena Owusuaa. It is alleged Frema Ashkar has been dating the artist since they started their working relationship. It got to a point that Frema Ashkar’s pastor allegedly revealed to the artist that Abena Owusuaa has used juju on him so it will be wise if he divorces her. Well, unconfirmed sources have revealed that Kwabena Kwabena is set to marry his manager not too far in the future. Neither the artist or Frema is willing to comment on these rumors but as to whether these rumors are true or not, time definitely tell.